You can use Selective import to choose products more thoroughly. Go to AliExpress section of AliPlugin Pro, choose Import Products and make sure you have installed AliPluginPRO extension before you start. This extension can be used for the Google Chrome browser only. 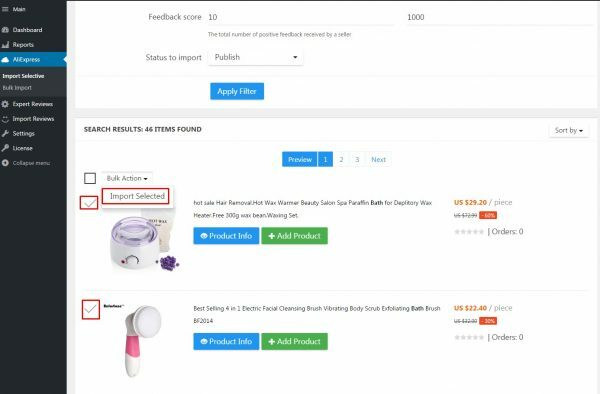 You also need to have any product page on aliexpress.com opened to import products. 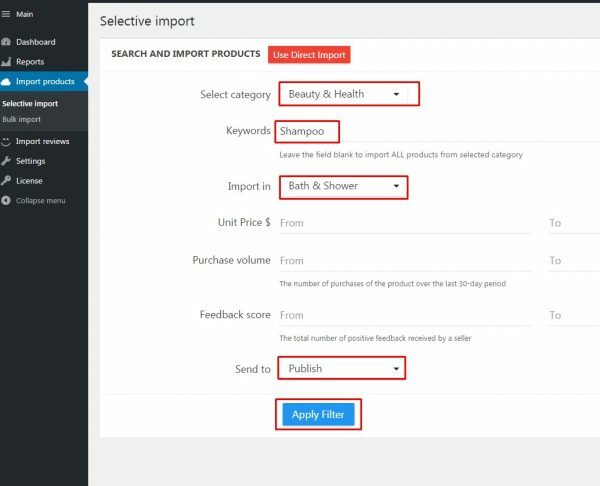 In the Import Products section of AliPlugin Pro you need to choose Selective import tab. Special filter options will help you to setup necessary searching parameters. Unit Price, Purchase volume and Feedback score are optional. You can also leave Keyword field empty to see all possible products from a category. Please, note that if you want the products to display on your website, you need to choose Publish in the Send to field. Click Apply Filter to start searching. The list of products with images and titles will appear. You can tick those products that you’d like to import and choose Import Selected in Bulk Actions. You can also use Add Product button to import a particular product. After the products are added to your store, you can check them on your WP admin panel in Products section. You can send the imported products in Draft and publish them later if you want. The default option is Publish, which means the imported products will appear on your site.